President Benigno Aquino III said on Tuesday that he has no intentions of seeking a second term in office. "There are some quarters that were saying I should try and go for a second term. 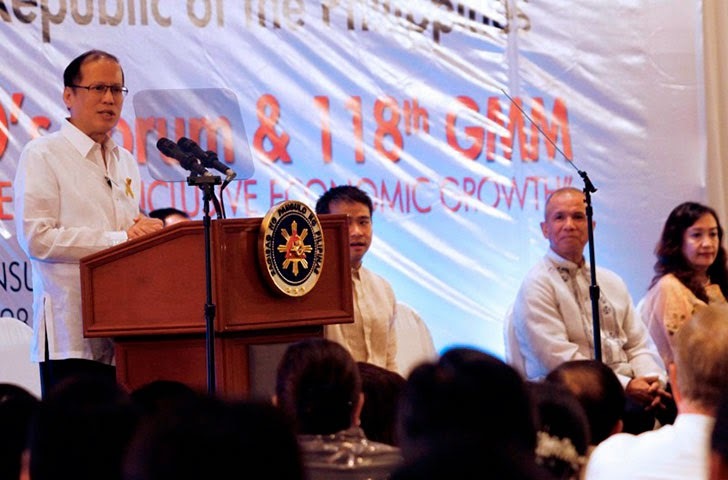 I don’t think that’s a right solution," President Aquino said during the open forum of the 13th CEO Forum and 118th General Membership Meeting of the Semiconductor and Electronics Industries in the Philippines, Inc. (SEIPI) at The Peninsula Manila, Makati City. The President was responding to a question on how he plans to ensure that the country’s economic growth is sustained after his term expires in 2016. "Now, with regards to how do we sustain this after 2016? Then, perhaps I will vote for the right candidate," he said, adding that voters should discern properly the candidate who is merely extolling populist sentiments with no substance, as opposed to the candidate who not only says the right things but who can be trusted to deliver on promises made. “There has to be that continuation of people of like mind who will deliver on the promises that are real and not just self-serving or nice, (or) pleasant to hear,” he said. President Aquino has yet to endorse a candidate for the 2016 presidential election. His administration is consistently saying that they would rather focus on governance than politicking. Present during the forum were Technical Education and Skills Development Authority Secretary Joel Villanueva, Trade Secretary Gregory Domingo, SEIPI President Danilo Lachica, and general manager of The Peninsula Manila Sonja Vodusek.